How Do Different Modes Compare? The region either already has or is planning for a variety of different modes. How do they compare? 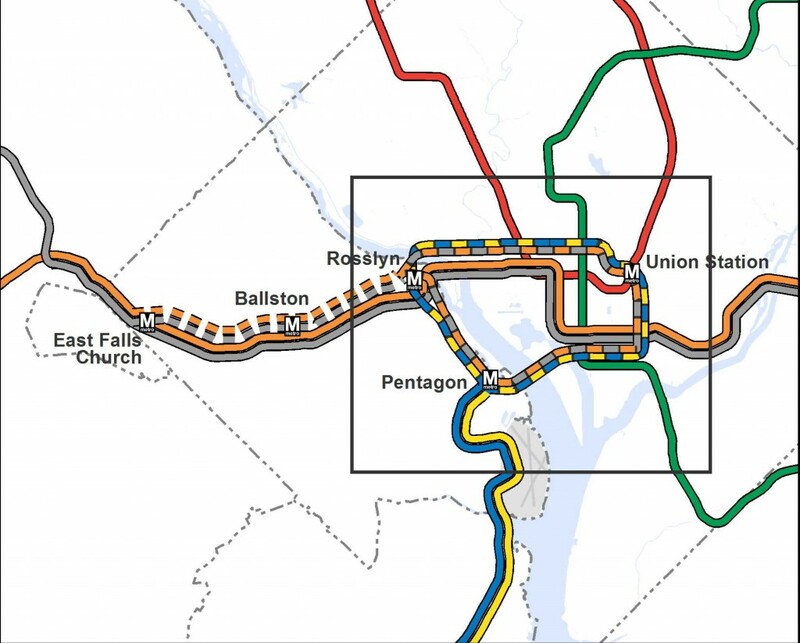 The Silver Line will soon open as a Metrorail line. Later this year, a streetcar will be operating on H Street, NE with others planned for Columbia Pike in Arlington and the District. Arlington and Alexandria are jointly building a bus rapid transit (BRT) line between Crystal City and Potomac Yard. 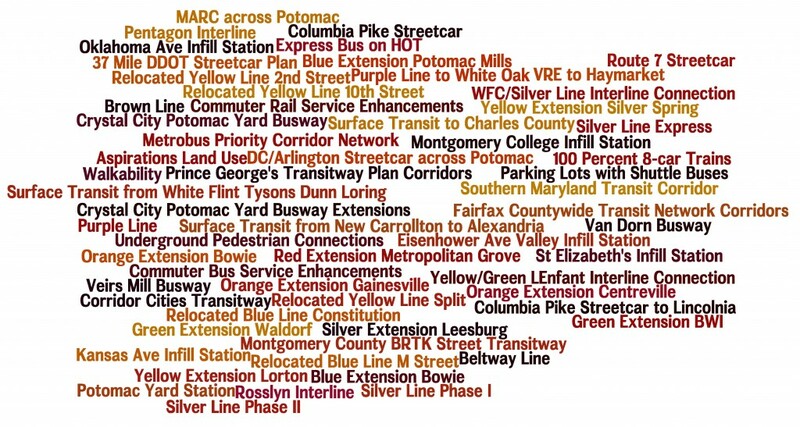 Once funding is finalized, Maryland will build the Purple Line and light rail transit (LRT) will connect New Carrollton and Bethesda. This is all in addition to the region’s existing commuter rail, commuter bus, Metrorail, Metrobus, and MetroExtra services. 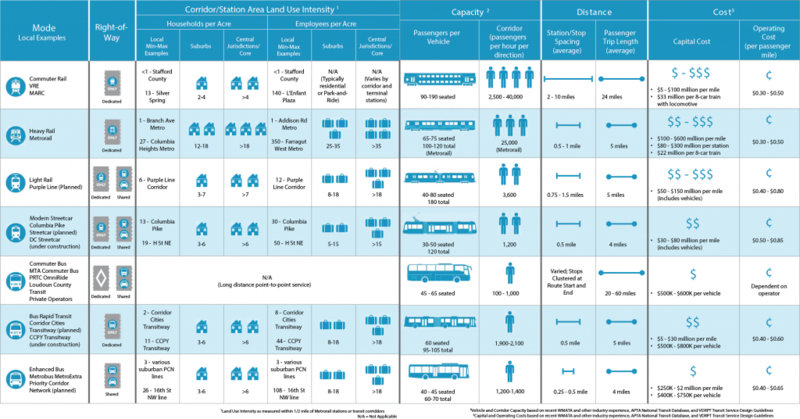 The region is not only expanding transit services, but it also expanding the types of transit modes that will operate. At long last, instead of talking about Portland (streetcar), Jersey City (light rail), or Cleveland (bus rapid transit), we’ll be able to point directly to services and infrastructure in our backyard or take a trip and experience the pros and cons of these modes for ourselves. So how do the different modes compare? What kind of purposes does each serve? There are many external factors and trade-offs that influence how agencies and jurisdictions select which mode to implement. As we see from the ongoing debates in jurisdictions across the region between LRT and BRT or streetcar and enhanced bus, there is not always one perfect choice. However, an array of transit and land use measures can provide context to the conversation. As part of ConnectGreaterWashington: The 2040 Regional Transit System Plan, we developed the below table to compare commuter rail, commuter bus, heavy rail, light rail, streetcar, bus rapid transit, and enhanced bus across land use intensity (households and employment), vehicle capacity, stop spacing, trip length, and capital and operating costs. What do you think? Does this information better inform the rail vs bus debate? What other information would provide more clarity on what modes work where? 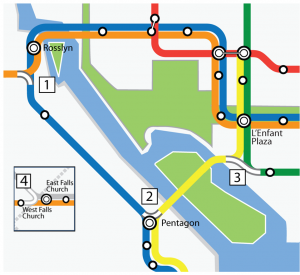 What About a Faster Transit Route Between Dulles and the Core? 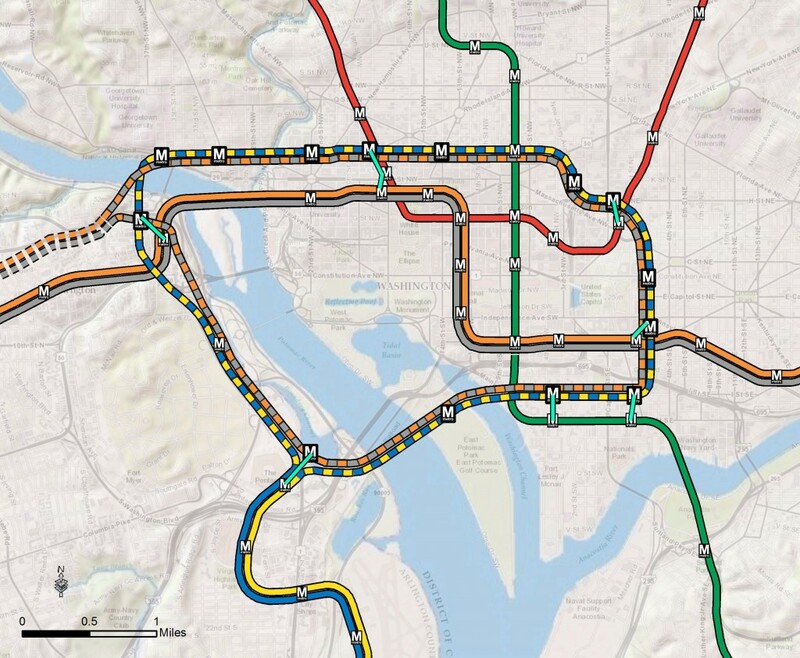 The planned Metrorail Line to Dulles Airport will provide a high-frequency, high-capacity link between the airport and the region’s core, and will enable travel between all Metrorail stations and the airport, without requiring rail-to-bus transfers. 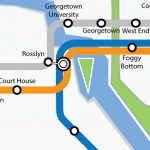 Concerns have been expressed about the likely Metrorail travel times between the airport and the core, and the capacity of the Metrorail system, as trains converge through Rosslyn and pass under the Potomac River. Could there be improvements that would provide faster service, expand the capacity, and also provide for greater flexibility for routing trains when service is disrupted, because of either incidents or planned major maintenance? To attract riders, transit travel times need to “be competitive with” other travel options, yet setting that competitive bar at the level of auto travel times doesn’t seem to be necessary (nor is it readily achievable.) 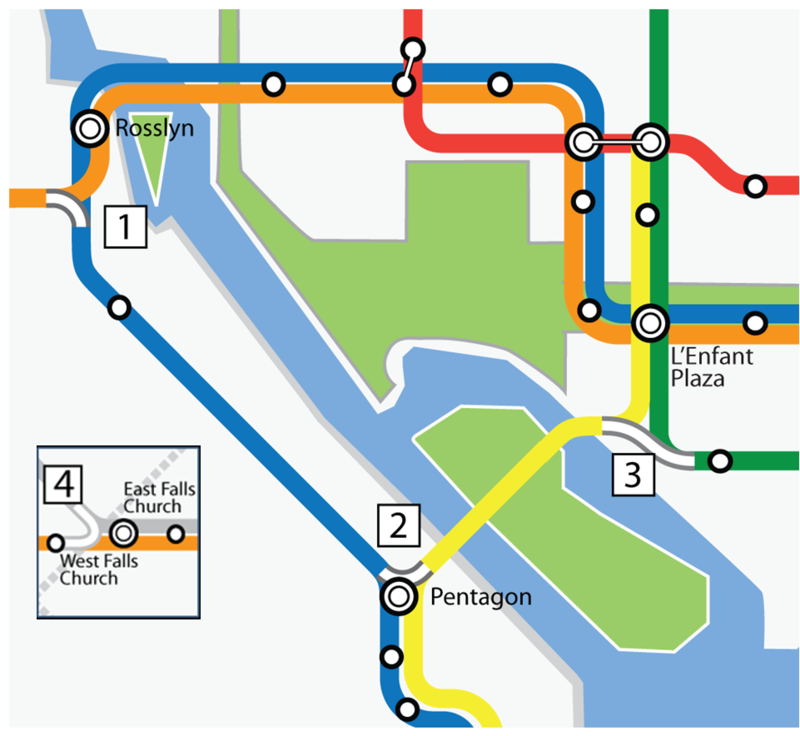 Reagan National Airport attracts many transit trips, even though driving times to the airport are generally shorter than by rail. While travel times need to be competitive, and a faster travel time would be more appealing and attract some more ridership, Metrorail to Dulles Airport will result in considerable transit usage by airport patrons and employees, not only to and from the core, but to Tysons Corner and other locations served by the Metrorail network. The purpose of this strategy is to allow different rail lines to operate on the same track. 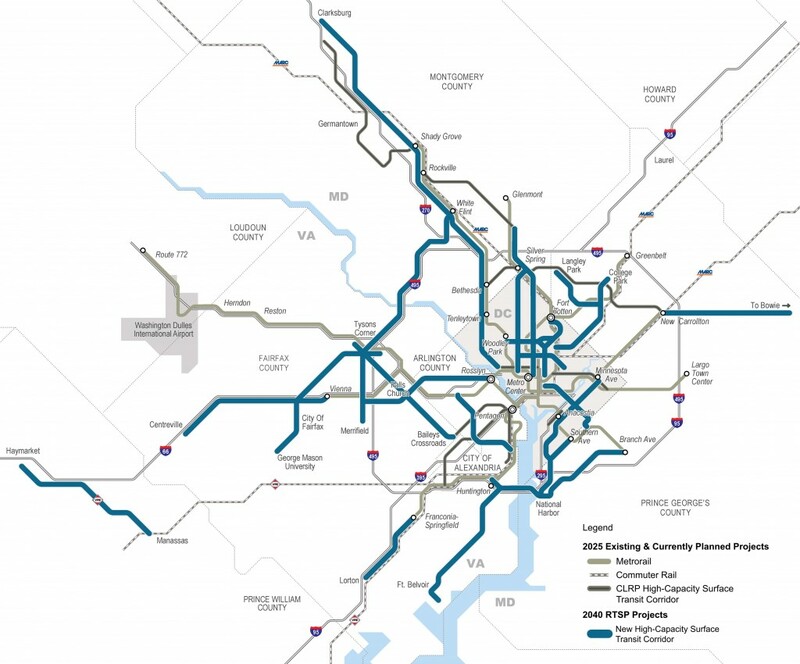 This type of operation can help reduce capacity constraint on some lines and provide new connections between existing Metrorail lines. BENEFIT: Allow direct access between Anacostia and southern Maryland to job sites in southern Arlington and the City of Alexandria.